In January 2001, Steve Jobs introduced iTunes and forever changed the way we buy and consume media. It’s the most important app that Apple has ever created. On a chilly, rainy day in San Francisco 15 years ago, Steve Jobs took the stage at the 2001 Macworld Expo to present new Apple products. After talking about boring technicalities of new hardware and software, Jobs switched registers. He introduced Apple’s digital hub concept, then started talking about a revolution. The icon of the current version of iTunes, version 12.
iTunes is 15 years old today and its history parallels that of Apple since its release in 2001. In less than a year later, Jobs introduced the iPod, the hardware device that, married to iTunes, would turn Apple’s fortunes around. As Apple introduced new iPod models, the company also added new features to iTunes. Version 2 was released to coincide with the iPod’s availability; version 3 added smart playlists and support for audiobooks from Audible.com. 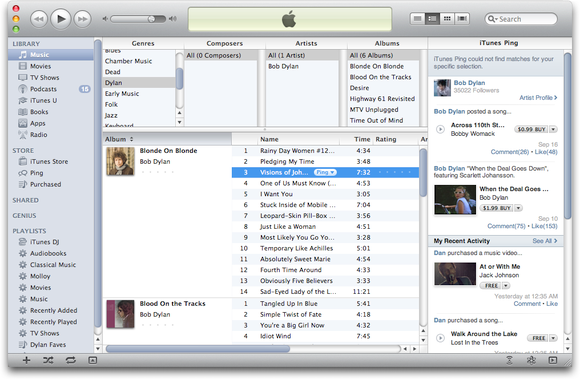 In April 2003, iTunes 4 introduced the iTunes Music Store, added support for the AAC codec, and more. Oh, and hell froze over later that year: Apple released a Windows version of iTunes, “probably the best Windows app ever written,” said Jobs. Launched with a mere 200,000 songs, the iTunes Music Store sold one million songs in its first week. By June of that year, a million iPods had been sold, and the world was soon rocking to their personal soundtracks while wearing the signature white earbuds. 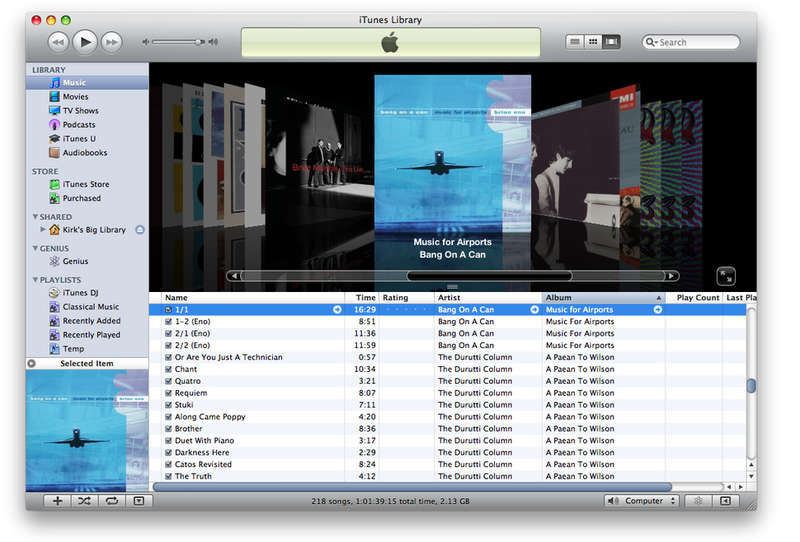 Here’s what the iTunes Music Store looked like in iTunes 4.
iTunes and the iPod made tech cool. Those earbuds were everywhere. Just as headphones marked the first portable music revolution when the Walkman surged in popularity in the early 1980s, the ubiquitous white earbuds bore witness to just how many people wanted to listen to music on the go and did so with Apple products. In April 2004, an incremental update, iTunes 4.5, saw some new features: the now-defunct iMix, the once useful party shuffle, and more. Through the life of iTunes 4, other enhancements included AirTunes—the predecessor of today’s AirPlay—to stream music over a local network, support for photos, and support for video. In June 2005, Apple added podcast support; together with a huge podcast directory in a section of the iTunes Music Store, it helped spearhead a revolution in that nascent media. 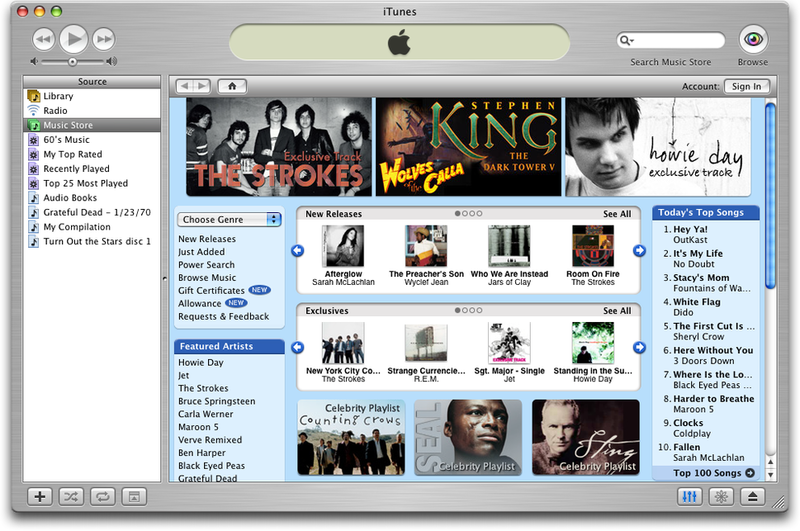 iTunes 5 and 6, released from September 2005 through June 2006, didn’t add many new features to the app, focusing more on compatibility, bug fixes, and minor enhancements. It did see the addition of video when the 5th generation iPod classic was released in October 2005, but it was iTunes 7, which lasted nearly two years—September 2006 through September 2008—that saw major new features. There were iPod games (remember them? ), gapless playback was added (finally), Cover Flow (now retired), and support, in early 2007, for the new Apple TV. Party Shuffle in iTunes 7.
iTunes’ progression mirrored that of digital media in general. At first it was about music and nothing more; the “tunes” in iTunes. But as digital technologies improved, and hardware grew new capabilities, iTunes shepherded different types of digital content to portable devices. Photos, videos, and later apps, all made the leap from the desktop to pocket-sized devices through iTunes. For years, Apple’s new product presentations focused on the iPod and digital music, with the rest of the company’s hardware being secondary. The company lived and breathed iPod, as Apple’s market share crushed its competitors. In February 2007, Jobs penned an essay entitled Thoughts on Music (curiously only available now on Apple’s Korean website), which would change the music industry forever. In it, Jobs bemoaned the use of DRM (digital rights management) on music downloads and offered alternatives. In May of that year, the iTunes Store introduced iTunes Plus, which was 256 kbps DRM free music, sold at a slight premium, allowing interoperability with other software and hardware. By then, the iTunes juggernaut was unstoppable and Apple could influence the way the music industry sold its products. Digital music sales soon eschewed DRM entirely. 2007 was, of course, the year of the first iPhone. Still linked to iTunes, this device became the hardware equivalent of that media management app, turning Apple into the biggest tech company of all time. By then, iTunes supported a full line of portable devices: the iPod classic, touch, nano, shuffle, and the iPhone. (And it also synced to the Apple TV, then a hard-disk based device.) And it added the App Store, whose success is lauded regularly, and which has helped contribute to the popularity of the iPhone. iTunes 8 and 9 moved ahead, consolidating Apple’s overall digital strategy. You could rent movies and TV shows, then buy movies and TV shows, you could download courses from iTunes U, and buy ebooks. iTunes added and refined more features: Genius Mixes and Home Sharing were added, and Party Shuffle morphed into iTunes DJ (since removed, and replaced by the confusing Up Next). 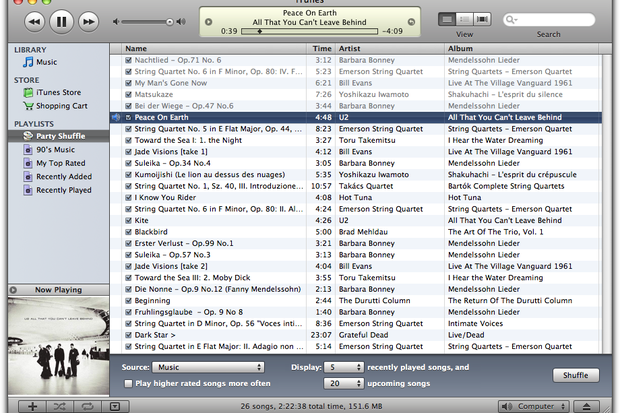 Cover Flow view in iTunes 9. During the initial iTunes introduction, Jobs said of the music apps that existed at the time: “They are too complex. They are really difficult to learn and use.” iTunes was becoming a confusing amalgam of features that no longer seemed organic and felt like they were cobbled together haphazardly. Apple added such features—later retired—as the Genius sidebar and the iTunes MiniStore, which didn’t make it easier to find and listen to music, but tried to funnel users into the iTunes Store to get them to buy music. The epitome of this marketing-led design was the fatal introduction, with iTunes 10, of Ping, a “social network for music,” which prompted me to write at the time, “I’m sure Apple has a plan, but so far, users seem to be greeting Ping with a big shrug. I know I have.” Ping didn’t last long; in October, 2010, it was replaced by the iTunes Sidebar, which, just as the Ping sidebar, was short-lived. iTunes 10 and the short-lived Ping. 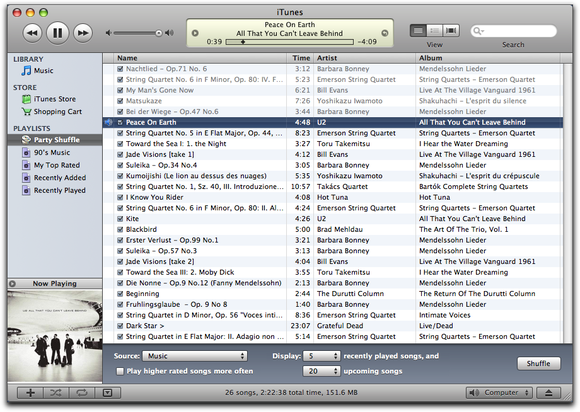 This was also when Apple made the iTunes sidebar a drab, uniform gray. In 2011, iTunes Match came into existence, yet never spread beyond the US, Canada, and Australia. And in the following year, iTunes 11 added iTunes in the Cloud, for purchased content, and also made major changes in iTunes’ interface, confusing users. iTunes Radio was introduced, and the two-year life of this version of iTunes saw a lot of fixes and minor enchantments, but nothing that made the program easier to use. When iTunes 12 saw the light in October 2014, Apple again pulled the rug out from under users, changing navigation within the app and making it even harder to find one’s way through a labyrinth of features. As we now know, the next step in digital music is streaming, and iTunes 12 embraced that in 2015 with Apple Music and the iCloud Music Library, which is the bane of people with carefully curated music libraries. And there’s no escaping the iTunes Store; it’s permanently baked into every nook and cranny of the app. iTunes initially came into existence because of “a music revolution” guided by Steve Jobs, who, as we know, loved music. Over the years, as digital content matured, iTunes became the hub for all that content. That’s not a bad thing in and of itself; lots of people love to call iTunes “bloated,” but I disagree. The problem now is that those who want to use iTunes for its original purpose, music, find themselves stuck in a morass of features designed to sell, sell, sell product from the iTunes Store. If only that were true now.